Music streaming service Pandora has had its ups and downs over the last two years since launching. People love to listen to their personalized radio stations that get more and more tailored as you tell it what you like and don’t like. But recent changes to the royalty rates they must pay the RIAA for playing music over the Internet will be going up drastically in the coming years. And licensing complications have led them to block out all non-U.S. listeners. 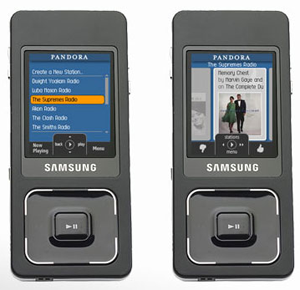 In their first mobile deal, Pandora is offering to stream radio stations on a number of Sprint handsets via pre-installed or downloaded software (take your Sprint phone browser to Pandora.com and you will be prompted to download the client). This is free for 30 days. After that you must have a Pandora premium account, which costs $3/month (this also removes ads from Pandora.com when you listen there). Sonos now supports Pandora, so you can stream Pandora music through your normal home sound system. Sonos has been aggressive about getting deals done with partners. They launched with Rhapsody last year, and announced support for Microsoft DRM earlier this year – meaning music from AOL Music Now, MTV Networks’ URGE, Napster, Wal-Mart, Yahoo! Music and the Zune Marketplace now play on Sonos devices. 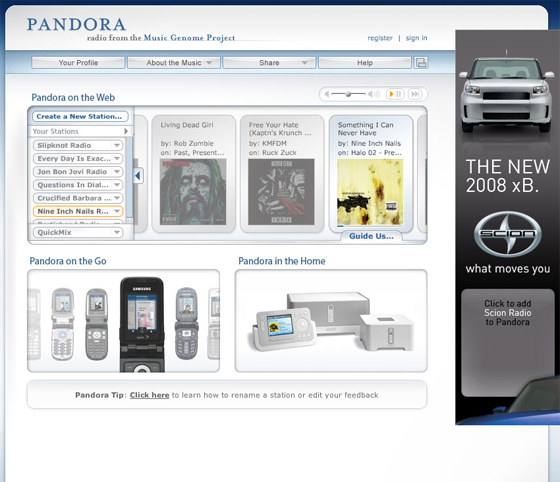 Pandora has also redesigned its website to better integrate the listening and community features. The company says they now have 6.9 million registered listeners who have played 4.7 billion songs and voted up or down half a billion times. This makes them, they say, the third largest Internet radio station in the world. They play 94% of their entire catalog every day, so they are dipping far into the long tail of music. Pandora also invited some of their heaviest users to the event tonight. On average, they say, their heavy users listen to Pandora for 18 hours/week.